If you’re interested in contributing to TIFO click here to read our article submission guidelines. Today I found out what a watt is. The evolving discussion over renewable energy technologies has a tendency to get a bit technical. Most of us who work in the renewable energy space take for granted that many potential customers, investors and partners haven’t spent any time in academia studying photovaltaics or wind turbines. In fact, they may not have a background in general energy metrics. Terms that once belonged to the realm of industry-insider jargon are quickly becoming standard. Thus, anyone who wants to follow the renewable versus traditional energy debate needs to know what we mean when we say “watt.” Here, then, is a brief crash course in energy lingo. The basic unit of energy is the watt (named after Scottish engineer James Watt). A watt is simply a unit of power in the International System of Units (SI) that measures the rate of energy conversion and is defined as one joule per second. To put that in perhaps more familiar terms, one nutritional calorie (which is 1000 calories or 1 Calorie, if you didn’t know) is equal to 1.1620 watt hours. For another example, an incandescent light bulb uses 25-100 watts. One kilowatt (kW) then is equal to one thousand watts. When electricity use is measured over time, it is measured in kilowatt hours (kWh) – in other words, how many kilowatts (kW) of electricity are used (or produced) over how many hours. Leaving a 100 watt light bulb on for 10 hours will use 1,000 watt hours – or one kilowatt hour. Your electricity bill probably measures your electricity consumption in kilowatt hours. Why aren’t power plants measured in kWh? Here’s a simple analogy to help understand the difference between kW and kWh. Imagine you have a bucket that holds 5 gallons of water. This is the capacity of your bucket. You can pour the water out of the bucket fast or slow. This rate would be measured in gallons per hour. Similarly, a power plant has a capacity of which is measured in kW. This is the maximum electricity it could generate at any given instant. Over time, however, different amounts of electricity can flow out of the plant and this rate is measured in kWh. The output of large-scale power plants is usually on the scale of megawatts (MW). One MW is equal to one million watts, so we’re talking about a very large amount of energy. As a general rule of thumb, each MW of a coal plant’s power plant capacity can supply around 650 average American homes (Assuming 10,000KwH/year demand of average US home and 75% capacity for a coal plant). 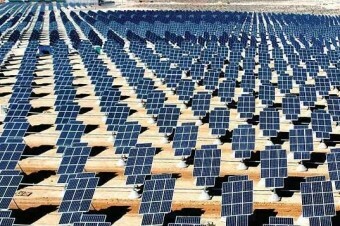 The world’s biggest photovoltaic power plants have capacities of between 40-60 MW each. These are huge installations, with tens and even hundreds of thousands of panels lined up on huge tracts of land. Wind turbines have capacities of around 1 or 2 MW each, although 5MW turbines are currently being developed. Thus, a wind farm comprised of a dozen turbines will have a capacity of around 18 MW of electricity. But wind turbines are modular, so wind farms vary widely in size, and large ones can even reach hundreds of MW. And of course, the amount of power that is actually generated will depend on how strongly the wind is blowing. In very windy years, that 18-MW wind farm may produce up to 62 thousand MWh (or 62 GWh) of electricity and 39 thousand MWh annually. In less windy years, that same 18-MW wind farm may only produce 39 MWh. Large-scale power plants can produce hundreds of MWh. A power plant with a capacity of 700MW, for example, can power half a million homes. These power plants often burn fossil fuels such as oil, coal or natural gas, but large-scale power plants can also utilize nuclear, geothermal or concentrated solar power (CSP). Unlike photovoltaic energy, which uses panels to convert sunlight directly into electricity, concentrated solar power uses heat from the sun to make steam, which turns a turbine. While most existing concentrated solar power plants have capacities in the 40-100MW range, the largest, in California’s Mojave Desert, is 354MW. Both large-scale and renewable, this form of energy is currently one of the fastest growing around the world. For very large-scale power plants, capacity is often discussed in gigawatts (GW). A GW is one billion watts, or one thousand MW. The ill-fated Chernobyl nuclear power plant, for example, had a capacity of 4,000 MW – that’s 4 GW – which accounted for about 10% of Ukraine’s electricity production at the time. Indonesia is talking about building 4 GW of new geothermal power plants, along with another 10 GW of new coal-fired power plants (there goes the planet). And then there’s China’s Three Gorges Dam, the world’s largest power plant of any kind, which will eventually be 22.5 GW. In large countries, analyses of the national energy economy are also discussed in GW. In 2009, for example, both Germany and China had around 26 GW of wind energy capacity, while the US had 35 GW. In 2008, the United States had around 335 GW of coal plant capacity, accounting for about half the country’s electricity production. *Suparna Kadam is a co-founder of GreenRay, Inc., developers of the first safety certified Solar AC Module and a provider of solar panels for your home. Kadam is responsible for the company’s financial management, corporate strategy, and marketing. During her 7 years in the PV industry, she has consulted for various PV companies and worked on commercializing several new products for Schott Solar. Prior to this, she led planning and execution of the business plan and fundraising at an early stage startup. She has also worked in a variety of roles at Intel, Air Products & Chemicals, and Ford Motor Company. She holds an MBA from the MIT Sloan School of Management and MS in Chemical Engineering. Eh, OK article but things could be explained better. One major irk- the basic unit of energy is not a watt, but a joule. Wattage is power, the rate of energy use. A watt is 1 joule/second, so a watt-hour is 3600 joules. Other than that, interesting article on power production and scales. OK. So I finished the article and realized that I still have no clear idea of what a “watt” is. So I reread the article. Still not clear. Does a 40 Watt bulb use 40 Watts a minute? an hour? The article defines watt as “a unit of power…that measures the rate of energy conversion.” Conversion from what to what? Power into light? Energy into heat?